We have secured the officially licensed American McGee's Commemorative Alice Vorpal Blade of which ONLY 1000 were made! 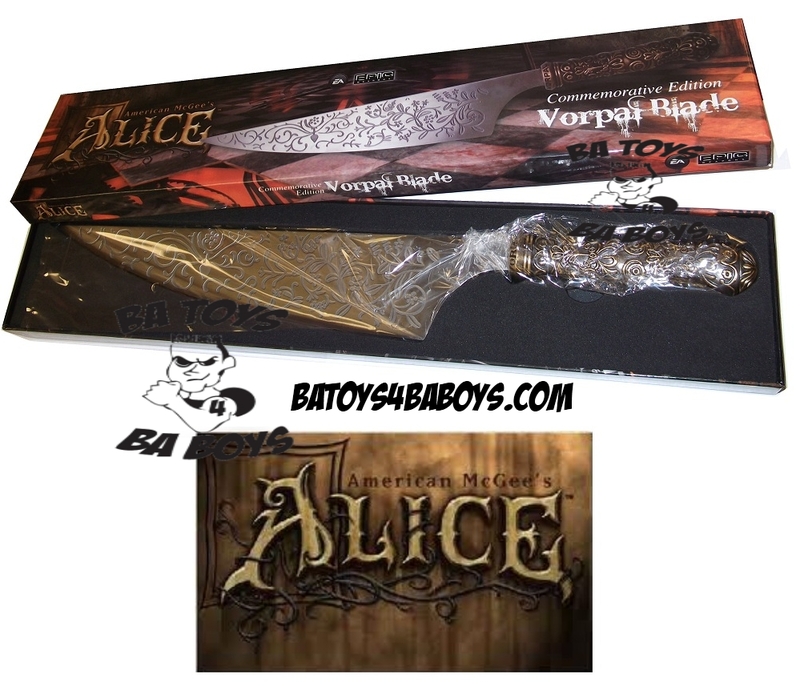 We are including the Commemorative Limited Edition Collector Boxes which make these Alice Vorpal Blades truly BA Toys! Sorry, but we are unable to guarantee absolutely pristine collector grade conditions on packaging(standard disclaimer) although the boxes are in extremely good condition! When Alice answers a summons to return to Wonderland, she barely recognizes the place. From the fungal rot of the Mushroom Forest to the chemistry of the Mad Hatter’s Domain, Wonderland festers to its core. Undaunted by the diseased ambiance and mortal danger that surround her, Alice must undo the chaos. In commemoration of the original Alice production, Epic Weapons, in collaboration with Electronic Arts, is offering this Commemorative Edition Replica Vorpal Blade from Alice. This replica is cast with the highest quality Japanese stainless steel with custom etched molds created to reflect the exact details of Alice’s primary weapon. ONLY 1,000 of these commemorative Alice Vorpal Blades were made!